Life requires constant maintenance, normal for anywhere you live, but more urgent on a boat. When you have multiple rooms and closets and a garage you can hide your half done projects instead of finishing them. It’s easier to put off those little chores that should get done. Justify not doing them right now. Small spaces, however, require immediate attention. Lest you hurt yourself or your dog tripping over the mess. And since I’m planning to shove off tomorrow to go anchor in the weeds for a few days, I have got some tidying up to do. This entry was posted on Sunday, September 4th, 2011 at 2:36 pm and is filed under Boat Improvements, Cruising Life and Trips. You can feed this entry. You can leave a response, or trackback from your own site. Smooth sailing and a dash of adventure are my recipe for your Delta trip. 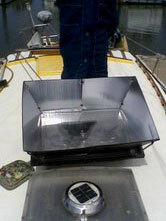 Love that solar oven!